Do not stop taking this medication without consulting your doctor. Some conditions may worsen or you may experience withdrawal symptoms (such as weakness, weight loss, nausea, muscle pain, headache, tiredness, dizziness) when this drug is suddenly stopped. To prevent these withdrawal symptoms when stopping methylprednisolone, your doctor may reduce your dose gradually. Consult your doctor or pharmacist for more details and report any withdrawal reactions right away. See also Precautions section. What conditions does Medrol treat? Tell your doctor right away if you have any serious side effects, including: unusual weight gain, menstrual period changes, bone/joint pain, easy bruising/bleeding, mental/mood changes (such as mood swings, depression, agitation), muscle weakness/pain, puffy face, slow wound healing, swelling of the ankles/feet/hands, thinning skin, unusual hair/skin growth, vision problems, fast/slow/irregular heartbeat. This drug may rarely cause serious (rarely fatal) bleeding from the stomach or intestines. If you notice any of the following unlikely but serious side effects, consult your doctor or pharmacist right away: black/bloody stools, vomit that looks like coffee grounds, persistent stomach/abdominal pain. List Medrol side effects by likelihood and severity. Before using this medication, tell your doctor or pharmacist your medical history, especially of: bleeding problems, blood clots, brittle bones (osteoporosis), diabetes, eye diseases (such as cataracts, glaucoma, herpes infection of the eye), heart problems (such as recent heart attack, congestive heart failure), high blood pressure, current/past infections (such as those caused by tuberculosis, threadworm, herpes, fungus), kidney disease, liver disease, mental/mood conditions (such as psychosis, depression, anxiety), stomach/intestinal problems (such as diverticulitis, ulcer, ulcerative colitis), seizures. This drug may make you dizzy. Alcohol or marijuana can make you more dizzy. Do not drive, use machinery, or do anything that needs alertness until you can do it safely. Talk to your doctor if you are using marijuana. What should I know regarding pregnancy, nursing and administering Medrol to children or the elderly? Some products that may interact with this drug include: aldesleukin, mifepristone, other drugs that can also cause bleeding/bruising (including antiplatelet drugs such as clopidogrel, "blood thinners" such as warfarin/dabigatran, NSAIDs such as ibuprofen, celecoxib, aspirin, salicylates). Does Medrol interact with other medications? Should I avoid certain foods while taking Medrol? If you are taking this medication once daily and miss a dose, take it as soon as you remember. If it is near the time of the next dose, skip the missed dose and resume your usual dosing schedule. Do not double the dose to catch up. 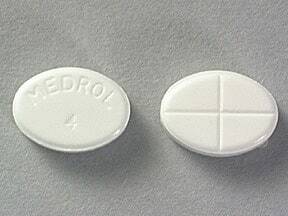 This medicine is a white, elliptical, double-scored, tablet imprinted with "MEDROL 4". Are you considering switching to Medrol? How long have you been taking Medrol? Can You Make Living With Psoriasis Easier?